Ethical Fashion Forum has launched a new series looking at what sustainability means to different job roles within the fashion industry. In this second instalment, they speak with six fashion designers, from independent to high street brands, about what they do. What is a fashion designer’s role? The role and responsibilities of a designer seems obvious but you might be surprised to hear just how diverse a designer’s job can be. Of course, it’s about the creative and technical aspects of designing products but it might also entail research, sourcing, textile science, creating new processes, sales thinking and more. If you’re an independent designer then the chances are you’re running the whole show, from accounting to marketing, as well as designing your products. In fact, designing often becomes secondary to these other responsibilities, with time for design resolved to nights and weekends when other priorities take over. For Julia at Sweaty Beatty, her day-to-day involves trade meetings with the sales team, researching and putting together mood boards, designing and design meetings, fabric and trim sourcing, and meeting with fabrics and prints suppliers. For research, Julia likes to visit Sweaty Beatty shops, speak to the in-store teams and to customers directly to find out what’s working, what’s not, and what they want to buy that they can’t yet find. She also goes to fitness classes to see what people are wearing depending on the different exercise activity. During the year, Julia might travel to visit factories or to source fabrics, mainly in East Asia or southern Europe. Sometimes, she gets to go on design inspiration trips to places like Brazil. Sally who specialises in accessories and jewellery works as a freelancer, often within big high-street brands. She spent three and half years as a handbag and accessories designer at Liberty. Sally’s design role entails creative strategy, working hand-in-hand with the buying and range planning teams. She also does trend and market research and goes on inspiration trips. She manages and resources new factories, mainly in the Far East, and will travel to visit producers. Clare Farrell worked in big fashion brands and a few smaller ethical brands before launching her own brand, No Such Thing. She was turned off by her experience working with one well-known corporate British brand. She didn’t like producing in such an unethical and wasteful way. As Clare now works independently towards building her own brand. She is responsible for all aspects of running the business – from financial accounting to sales and marketing. It’s a joy when she gets time to work on designing products. Clare shows how challenging it can be to balance priorities when first starting out. Like Clare, Francisa set out on her own after having worked for years within big American fashion brands. She worked her way up to Director of Accessories for one of the biggest brands in the U.S. and then had a severe allergic reaction to leather products. She began getting headaches, which then progressed to seizures. She developed a chemical sensitivity that people can get from exposure to paint and VOCs. Her medical condition developed over the years and finally took its toll causing Francisca to quit her job. She had no idea that the chemicals she worked with to develop accessories had such a toxic potential. Francisca started vegan women’s shoe brand BHAVA in 2013 after quitting her corporate career and has since founded the Ethical Fashion Academy in New York City. Like Clare, she works independently and is responsible for all aspects of running the business, including sketching, designing, creative strategy and more. Valerie Goode, of UK-made luxury womenswear brand Kitty Ferreira, has a similar story. She worked for many years as a Senior Womenswear Designer for suppliers to European high street chains in Guangzhou, China and was affected by the widespread pollution of the industry. Valerie launched her brand in 2012 because she loves fashion but wants to change it. Like Clare and Francisa, her role is comprehensive but she has a special focus on designing clothing that uses naturally dyed, organic and cruelty free silk. How does sustainability relate to the fashion designer’s role? Social and environmental issues can be quite relevant to a designer’s day-to-day work, depending on how much autonomy the designer has in making critical product designs. How designers create products can have a huge impact on the people who manufacture it and the products’ resulting impact on the environment. To Valerie Goode of Kitty Ferreira, “the ideas of ethics and sustainability are an extension of yourself – these values come from the heart.” To her, sustainability in practice is an antithesis to fast, throw- away fashion. As well as sourcing, Valerie produces exclusively in London. Keeping the brand’s carbon footprint as low as possible throughout the supply chain. “Sustainability not only runs through the business model but through the products themselves; manufacturing with high end finishing to promote durability and longevity,” she says. How do designers incorporate sustainability practices in their work? For her stylish women’s cycling gear, Clare uses organic and fair-trade certified cotton sourced from Turkey and end-of-roll or deadstock Tyvek. She also spent a lot of time seeking out non-toxic alternatives to waterproofing finishes. This is, of course, crucial to well performing cycling wear. She tries to source everything as close to her home as possible. Before joining Sweaty Betty, Julia worked for Adidas where she had much less control over the design and product development process. At Adidas, there was a library of recycled and organic materials to choose from, though they often came at a higher cost. She was sometimes quite limited to certain price points but there was a general mentality at Adidas that doing things better was possible. At Sweaty Betty, the company doesn’t really focus on sustainability. It’s more Julia’s personal interest than something the business actively engages with. You might think that yogi’s would be more sustainability-aware consumers, but interestingly their customer feedbacks suggests the contrary. BHAVA is a vegan footwear brand, so Francisca never uses leather and this can be a sustainability challenge. Leather alternatives are often plastic-based and not inherently sustainable, so she looks to work with carbon-neutral manufacturers. She use organic cotton for the shoe lining. Paying attention to quality is also super important to ensure she’s making a product that lasts and won’t be thrown away easily. Valerie from Kitty Ferreira strives to use natural, non-toxic materials and processes. She sources and produces as close to the UK as possible in order to minimise the brand’s carbon footprint. She also looks to reuse materials or to use dead stock fabrics in order to tackle waste issues. Sally works with leather and PU, which has unique challenges that don’t apply to other materials or processes. In addition to looking for good veg-tanned leathers, she’s excited about how 3D printing could revolutionise the accessories market in future, in a way that could drastically reduce waste. “Making small changes in materials we use and the way we produce could make a massive impact. People are aways looking for the next best thing. I think that people are becoming more aware of the impacts that we are having on our environment. People are also getting bored of throw-away fashion and want something that lasts a little longer,” says Sally. Francisa Pineda sees how designers, especially independent ones who are building their brand like she is, will increasingly need to adopt strong marketing skills. Today’s internet-driven world, sharing your daily experience online is important. Designers are already seen as the spokesperson for the company. As a person, they can drive brand image. For example, if she’s in Bali at an eco resort, she should be sharing photos from her trip with her customers and community. It shows that BHAVA is more than just a product, it’s part of a lifestyle. Clare from No Such Thing wants to see other designers better understand the implications of the decisions they make and to think about their fabric choices with sustainability in mind. Julie from Sweaty Betty sees sports and activewear as market that’s going to keep on growing. Their customers are certainly becoming a lot more aware of their sports gear and care more about technical fabrics and the performance of their clothing. Plus, they want something that looks good too. There aren’t many brands cornering this part of the market yet and doing it well. 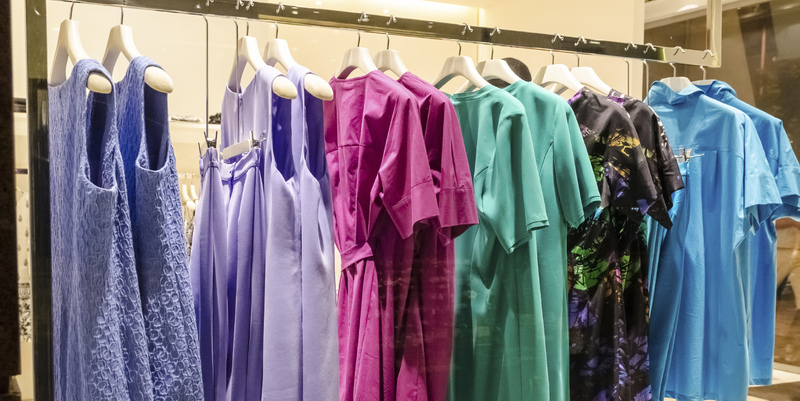 This article was written by Sarah Ditty, Editor-in-Chief and Stephanie Lau, Editorial Researcher from the Ethical Fashion Forum. 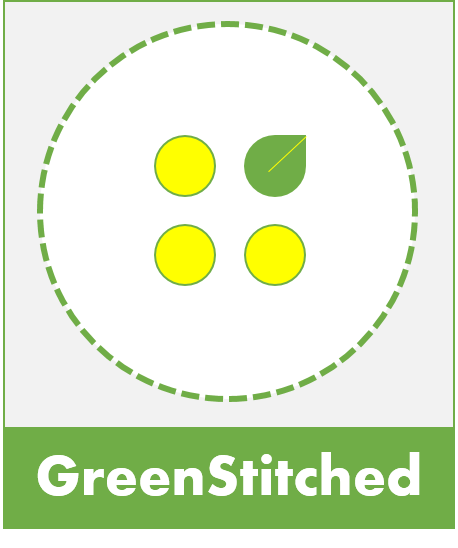 Read the first installment What Does Sustainability Mean To a Garment Technologist? This entry was posted in Conversations and tagged ethical fashion forum, fashion, Sustainable fashion. This year’s Council of Fashion Designers of America (CFDA) Fashion Awards in New York City Monday, not only recognized fashion designers, journalists and influencers, but activists who interrupted the event shed some light on one of the biggest names in fashion reportedly contributing to forest destruction. Dressed in formal wear for the event, activists from Rainforest Action Network’s (RAN) Out of Fashion campaign, displayed a large banner and handed out balloons and business cards printed with a parody logo of the demonstration’s target, Ralph Lauren. The logo features the brand’s name in its iconic navy and tan but positioned on a circular saw. 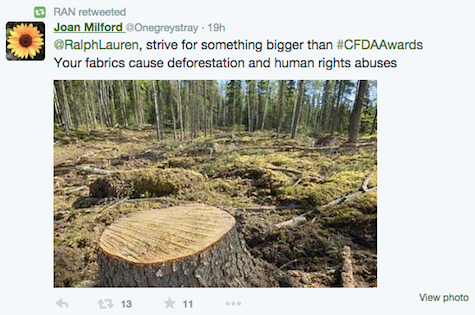 RAN is accusing the luxury brand of making clothes at the expense of deforestation and human rights abuse and is urging it to adopt new policies that commit to using only forest-friendly fabrics in its products. 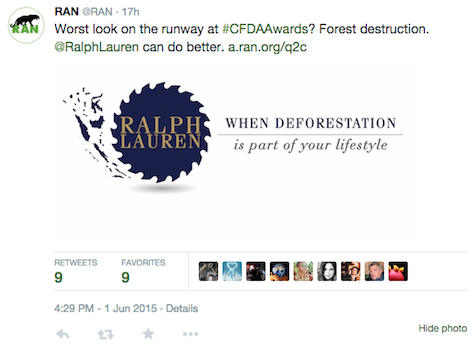 In addition to their live protest at the awards, RAN also called out Ralph Lauren over Twitter. Many supporters of the organization’s campaign chimed in as well. Ralph Lauren is just one of the brands among the “Fashion 15” group of companies RAN is urging to take responsibility for their supply chains, including Prada, LVMH, Tory Burch, Michael Kors, Vince, Guess, Velvet, L Brands, Forever 21, Under Armour, Footlocker, Abercrombie and Fitch, GAIAM and Beyond Yoga. RAN said it wants the brands to identify negative manufacturing components and develop commitments to protecting forests and human rights. ** This post first appeared on Sourcing Journal here. This entry was posted in Brands and tagged Endangered Forests, fashion, luxury, Rainforest Action Network, Ralph Lauren, rayon, Sourcing Journal, viscose.